First dram of the night is a double cask matured, sherry and “traditional”. 70cl / 43% / Distillery Bottling - A recent release from long-time TWE favourite Aberlour, this 16 year-old has been double-matured in traditional oak and sherry casks. Deep and complex, with lip-smacking spices - not as sherry-sweet as the 18yo. Nose (88): more than average. honey, toffee, citrus, plums, creme brule. Palate (89): powerful, oily. honey, tobacco, spices, pepper, citrus, apples, wood, leather. So based on other whiskies I have already tasted I rate this Aberlour 16 Year Old / Double Cask Speyside Single Malt Scotch Whisky with 88 points over 100. Aberlour Abunadh is a classic sherry monster. Matured in oloroso sherry oaks this whisky is crafted in single batches that range from very good to deliciously good. 70cl / 43% / Distillery Bottling - This 18yo expression is an excellent addition to the range from Aberlour (already one of our favourite distilleries thanks to the excellent a'bunadh). One of the stars of the show when it was launched at Whisky Live in 2008: rich and fruity, with a great textured mouthfeel. Nose (89): more than average. honey, wood, raisins, vanilla, citrus, flowers, cinnamon. Palate (89): smooth, oily. honey, wood, vanilla, citrus, spices, candies, raisins. Finish (89): longer than average. honey, ginger, candies. 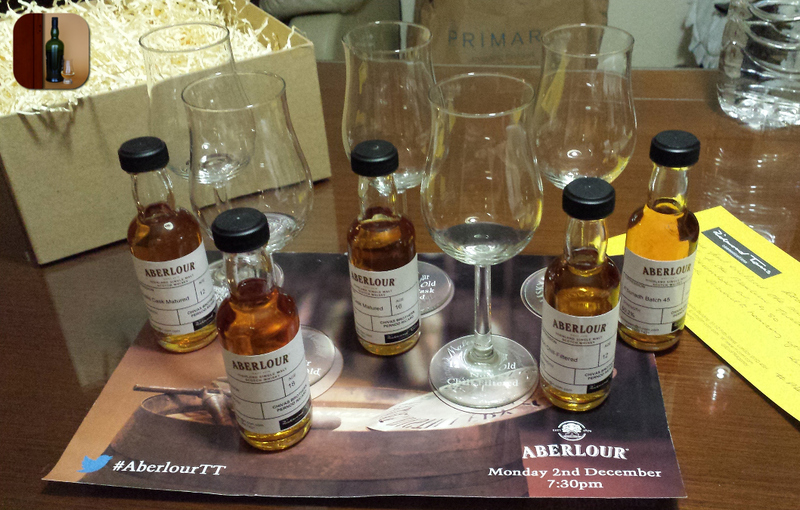 So based on other whiskies I have already tasted I rate this Aberlour 18 Year Old with 89 points over 100. Nose (90): more than average. honey, candies, flowers, vanilla, toffee, spices. Palate (90): powerful, oily. honey, vanilla, citrus, spices, flowers, pears, oranges. Finish (90): longer than average. honey, vanilla, liquorice. So based on other whiskies I have already tasted I rate this Aberlour 12 Year Old / Non Chill-Filtered Speyside Whisky with 90 points over 100. A fantastic whisky tasting with special mention for the Aberlour Abunadh 45, always fantastic, although this time it is even better. A real pleasure and a huge thanks you to Steve and Ann for a great night.